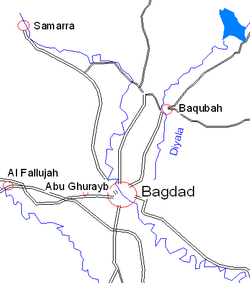 ^ "Ba'qubah". Global Security. Archived from the original on September 2, 2009. Retrieved 2009-09-14. ^ Austin, H. H. (2006). The Baqubah Refugee Camp: An Account of Work on Behalf of the Persecuted Assyrian Christians. Georgias Press. Retrieved 2009-09-14. ^ "SSG David S. Perry". Honored MPs. The Anniston Star. Retrieved 18 June 2015. ^ "U.S. military launches operation against al Qaeda in Iraq". CNN. 19 June 2007. Archived from the original on June 18, 2007. Retrieved 2007-06-19.